Lake Oswego Squirrel Removal is a very common call we get that can be difficult to handle if you do not know much about squirrels. When you hear scratching noises in your attic or walls you might have squirrels, but they are commonly confused with rat's and mice too. We have been handling Lake Oswego squirrel control problem for many years and can help solve your problem. If you think you might have squirrels in your walls or getting into your attic contact us and we can set up a time to come out and let you know the best way to solve the problem. When you hear noises in the attic, the easiest way to find out if you have squirrels is to watch your roof during the early evenings and in the mornings. 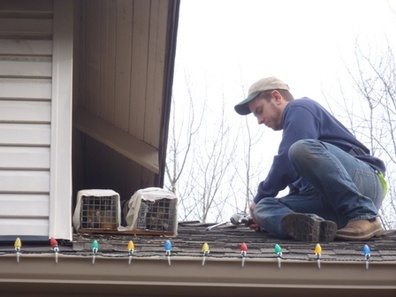 If you see a squirrel running on your roof most likely that is your problem, but if you are not sure you should contact a professional to help identify your problem. Depending on the type of roof and how steepness, it can make the job a lot more difficult to accomplish, but we have years of experience solving these problems. We have different methods for solving squirrel problems and the best way to find out how to deal with a certain problem is to have an inspection. In some cases we are able to trap and remove the current problem squirrels then seal up the access holes. Depending on the time of year squirrels might have babies in your attic which makes it much more difficult to solve. During the spring and summer a squirrel can have babies inside as well. This can require a totally different method because we do not want to seal the babies inside.